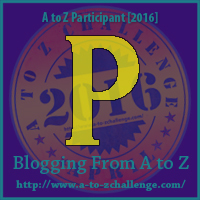 P is for Plumeria. My favorite flower in the world. 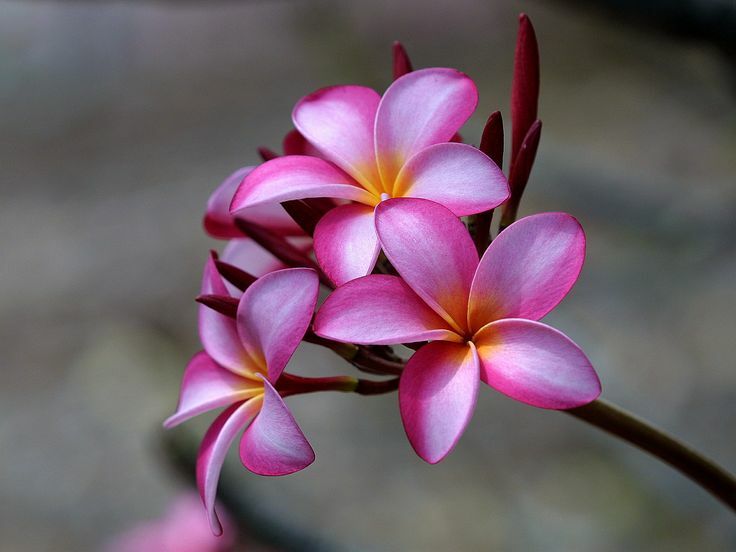 When I was in Hawaii, I was in love because they have plumeria's growing everywhere and in all different colors. Pink is my favorite color and these pink plumerias are gorgeous! They take me back to the wonderful trip I had to Hawaii in 2009. As I write this blog post, I am imagining myself sitting on the beach, with one of these on my ear, listening to the waves. Ok, back to reality. Today, I made a more papercrafting project. 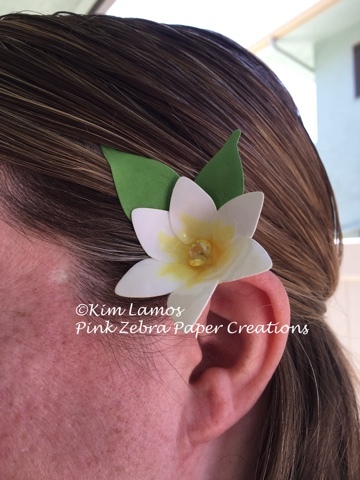 I took the Fun Stampers Journey Flower Layers Die and made a hair accessory. Here is the flower laying on the table. Here the flower in my hair. I die cut a Flower Layer flower from the die set with Whip Cream Cardstock and the leaves with Limeade Splash cardstock. I colored the inside of the flower with Copic markers. I then took the flower and cut the petals a little deeper. 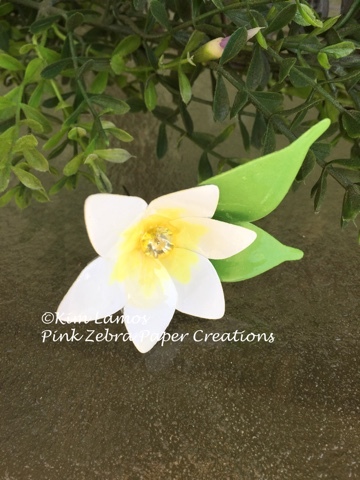 Then I took the petals and overlapped them slightly and glued them, to form the cone shape of the flower. Before I assembled the flower hair accessory, I covered the flower and the leaves with a thick layer of Journey Glaze and let dry for a little bit. When I came back, I curled the petals a little bit more. I then added the leaves to the bottom of the flower. Lastly, I took a crystal topped pin, colored the crystal with Lemon Drop ink and poked it through the center of the flower. This became the hair pin part. Enjoy!